Mike Aspengren says: "I hope you share the construction plans for your watercolor sketchbook pochade contraption. I've already ordered the hinges from Amazon. 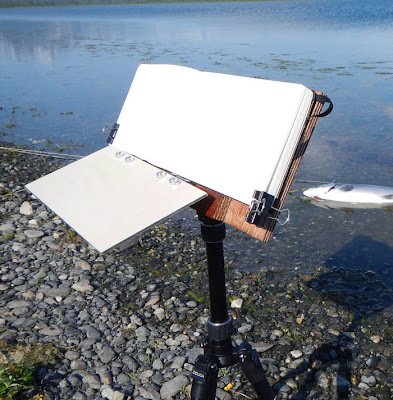 :)"
Patrick OHearn built a rig that he call the "Gurney Casein Traveler Mark II" and took it on a fishing trip to the Alsek River in southeast Alaska. 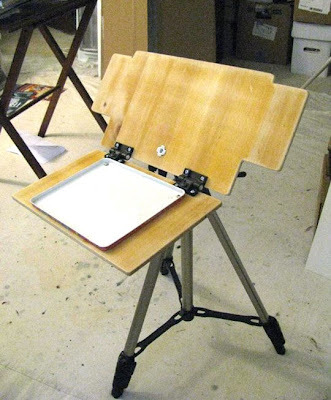 Pat says, "The paper support is made from epoxy-impregnated marine plywood and the fold-down palette is Alupanel, two thin wafers of painted aluminum sandwiching a resin core. Alupanel is used a lot in the sign industry and is very sturdy and very light weight. Hinges are Southco SC 773 adjustable friction hinges. The tripod is a Dolica TX570 ultra compact that folds down to 12.5". All of that plus the casein paints, brushes, moleskin watercolor notebook, and misc other stuff fits easily into a backpack, along with all necessary fly fishing gear, water, lunch, and bear spray." Jason Peck built the "Steampunk Watercolor Pochade." He says: "The side palette is attached using 2 S-shaped brackets and a binder clamp. I used those little S-shaped brackets that you use to hold a canvas in a picture frame. They come in different sizes. All you need is a couple of screws, washers and a nut. I found some fancy looking brass nuts at the hardware store. I'm using a metal key ring belt clip so that the magnet in my water cup has something to grab onto. The black palette is used sort of like a drafting table." Jason continues: "Here it is an its other configuration. 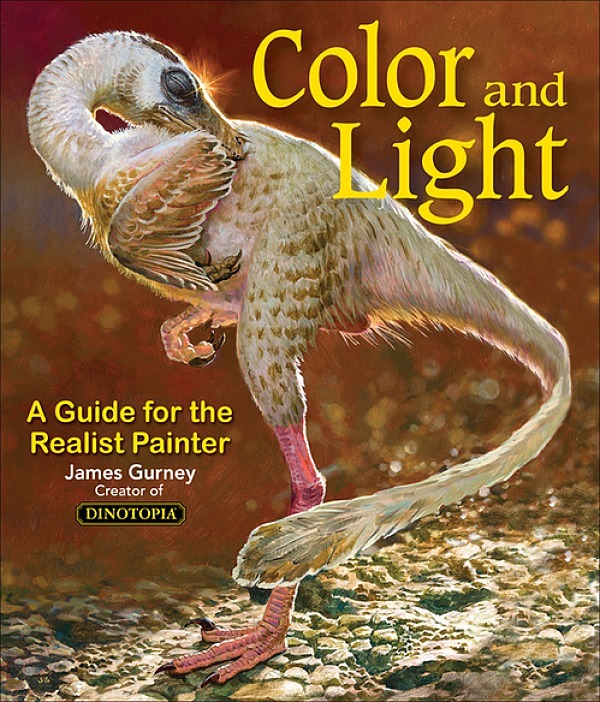 If I flip it around, I can use the Grey palette for oils, or casein. I coated the grey palette in polyurethane." Matthew Mattingly went mobile with his rig, which he calls the Bi-Sketch-Cycle. 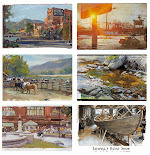 He says: "I've been enjoying using the rig and experimenting with casein as a plein-air sketching medium." Here is Matthew's "Clementine Caddy." 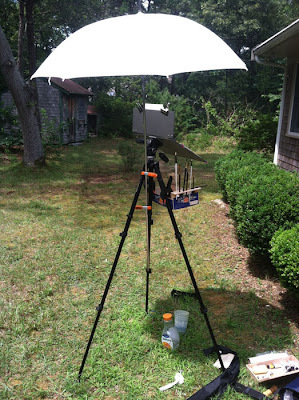 ...and his rig in the tripod/umbrella configuration. ....and here's one more by John Trotter. 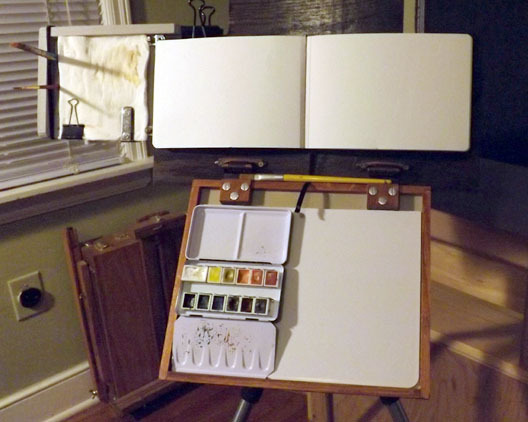 The cruciform panel shape allows you to rubber-band the long horizontal sketchbook, or clip a larger watercolor block or panel if you prefer. Note the 4-prong T-nut (1/4 20) mounted into the plywood to hold the unit to the tripod. Thanks, all for sending in your improvements and innovations. I'm working on my Wingsuit Aerial Video Pochade System" but I can't find the right brass nuts. and in this post "Go Vertical"
Wow, what a nice surprise to appear on Gurney Journey! Thanks for showing off my project, James, and even more for providing the original idea! 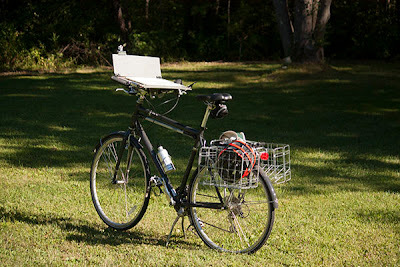 If anyone wants to see more pics, including the subsequent seat post modification, it's up over on Sketching Forum. Nothing about this post- but I've been hearing about the film 'Tim's Vermeer' - do you have any comment on that? Is he really so amazing that he must have been using some kind of scientific projection method? Peter, I saw the clip, and it seems to reiterate Hockney's thesis about the supposed use of optical devices by Vermeer and his contemporaries. I've tried drawing using the methods Hockney discusses, such as the concave mirror projection, and it's incredibly cumbersome and awkward. Haven't seen the movie, of course, but as for Hockney, I think he's half right. Surely artists were aware of and interested in lens effects and projections, but I doubt they used them as much as Hockney seems to think. I think Hockney underestimates or doesn't fully understand the power of traditional good drawing methods accomplished by straight observation. James, the place to get the brass nuts as well as myriad brass (and other metals) fasteners is albanycountyfasteners.com. I ordered brass knurled thumb nuts from them and got 25 pieces for under $6.00, delivered. The threads are finely machined. I really enjoyed this post--art furniture always excites me, especially when it's custom made! I totally agree with your assessment of Hockney's views. We have so many exceptional artists today that draw with amazing clarity and beauty, sans lenses and cameras. It would be folly to think that artists of old would not be able to accomplish the same. 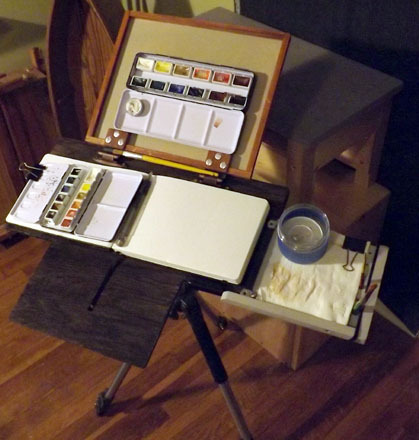 Wow, those are some nice watercolor setups. I made one minor adjustment to mine. I made a brush holder out of a tin can. Ill send you some pics of it in the field soon. I don't watercolor en plein air but I occasionally oil paint. I got a sweet set up made from another artist in San Luis Obispo named Gary Parks. Here's the link to his ebay stuff. He'll make a watercolor set up too. for some reason I'm totally obsessive about painting and drawing kits and gear both for indoor and outdoor. Is there a psychologist here? can we get some insight into this terrible neurosis? 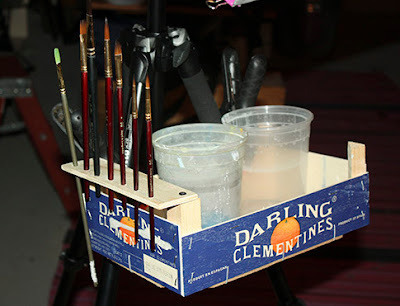 These are great -- I like the oil/WC reversible palette idea and the clementine caddy. Does anybody know if Diobond is the same as Alupanel? I made a prototype with the southco hinges, plywood, a brass insert (like a T-nut-- used for attaching to the tripod head) and a small butcher tray (attached to the plywood base with industrial velcro for easy removal and cleaning). Because Im a slow painter, I also have the option of using weekly medicine trays (that attach to the butcher tray with magnets) to store the blobs of raw paint in. I can close the lid, keep a wet sponge on top or use a spray mister to keep the paint wet. Love all tye DIY...i think the same love of problem solving, which art draws on, leads us to constantly try to invent a better wheel! How timely. Our group, Chaparral Artists had a demonstration yesterday on Plein Air painting by Art Mortimer and a lot of people were excited about the process. Thank for having one of the most informative blog on the internet. Tom, good point. It's just a matter of preference. I like working big sometimes and I have a larger Moleskine, but I don't use it as often. I love working small and tight, and I often paint in tight spaces, such as restaurants, buses, and alleys. Also, I admire the plein air work of Trost Richards and Church, who also worked small. But there's no reason you can't make a rig for working bigger. I am curious if anyone has found a good online place to purchase both a T-Nut for tripod connection as well as a Southco adjustable hinge? I have a homemade oil pochade box that I want to get off my lap and onto a tripod. You can get both through Amazon, but each item comes from a different vendor, so the shipping gets out of hand. John, I"m not sure where to get them online. Little hardware bits cost a lot in shipping. I get my T-nuts from my small town hardware store, but I noticed that our Lowe's didn't carry them. Let me know if you find out. I found T-nuts today at our local Ace Hardware. I am wondering how the base of the last photo keeps that angle?? Does it have some type of bracket underneath? ?